Hauraki Gulf is one of New Zealand’s outstanding areas of seabird and marine biodiversity – right up there with the subantarctic islands and the Kermadec Islands. Moreover, what is unique about the Hauraki Gulf is that it contains a massive Marine Park, itself containing five marine reserves and an exceptional suite of islands, all on the doorstep of the largest metropolis in the South Pacific! The Hauraki Gulf Marine Park (HGMP) was established under the Hauraki Gulf Marine Park Act (2000) and includes the foreshore and seabed of the Hauraki Gulf, Waitemata Harbour, Firth of Thames, and east coast of the Coromandel Peninsula. This diverse region encompasses marine reserves, five an internationally recognised wetland on the Firth of Thames at Miranda, hundreds of islands ranging in size from Aotea/Great Barrier Island (27 761 ha) down to significant stacks such as Maori Rocks (Mokohinau Islands) (0.24 and 0.18 ha) and all waters out to 12 nm. There are around 10,400 species of birds worldwide. Remarkably, only 359 of the global total of birds are what we call ‘seabirds’. Seabirds breed on islands, but spend most of their lives at sea. They are essentially marine creatures and possess unique physiological and morphological adaptations. They can be highly mobile, and in some cases the whole population of a species can travel from one side of an ocean to another. They come in all shapes and sizes and are highly specialised. New Zealand is ideally suited to seabirds; surrounded by productive oceans, presenting a multitude of breeding habitats and having been isolated from mammalian predators for millions of years prior to human arrival. It is thus no surprise that the New Zealand archipelago has great seabird diversity with 85 breeding species of which 36 are endemic species (42%) breeding nowhere else in the world. Indeed of 359 seabird species worldwide, approximately one quarter breed in New Zealand and 10% are endemic to New Zealand breeding grounds, making the country a world centre of seabird diversity. All seabirds breeding within New Zealand are fully or in a few cases partially protected under the Wildlife Act 1953 and its amendments. 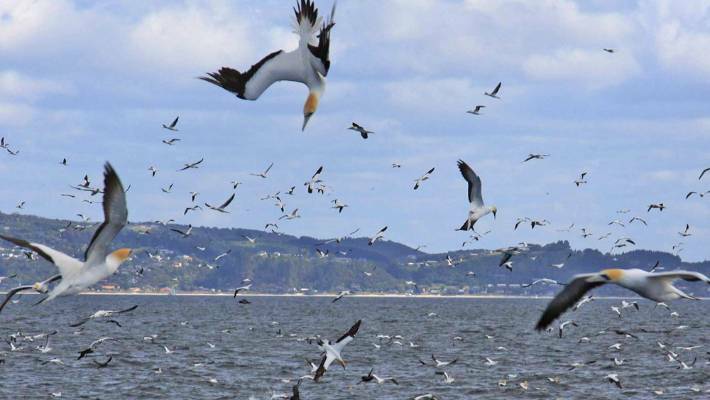 Seabirds in the Wider Hauraki Gulf Region (WHGR) breed on a large number of island and coastal sites that are administered by Department of Conservation (DOC), regional authorities, private landowners and local iwi. People seeking to visit these sites need to consult with landowners. The inshore and offshore islands of the Hauraki Gulf and Auckland’s west coast are a lifeboat for seabird populations and many are administered by DOC. The WHGR is vitally important to the economic, social and cultural well-being of people from the greater Auckland region. As outlined seabirds represent a jewel in the biodiversity crown of the WHGR. Understanding and protecting seabirds and their habitats stands to significantly benefit both people and the environment.